I talked to Chef Michael from Brigadoon, and indicated I’d like to take another crack at climbing the monolithic whale tail on Paris Hill. Hoping he can come with me, as he’s done it several times before, and it’ll help me to see how before I tackle it. We’ll see. 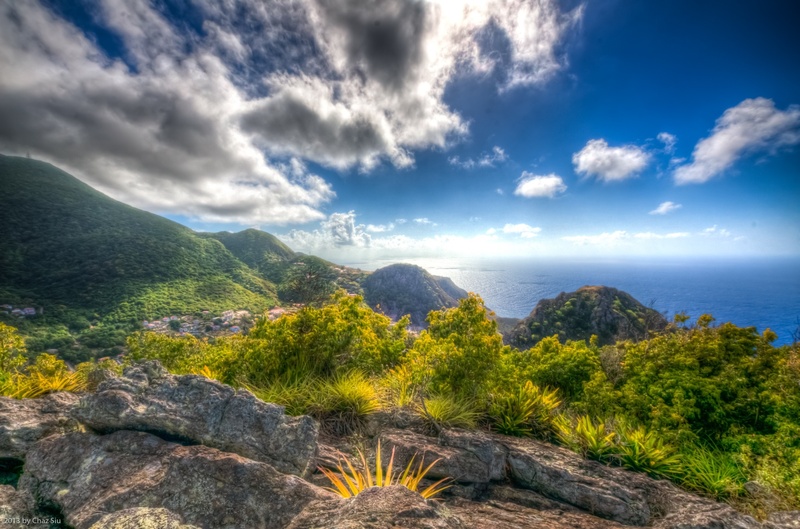 In the meantime, here’s a sample of the gorgeous south coast views of Saba from Paris Hill. I’d like to especially thank the foreground yucca for acting like a mini-sunrise accent to the picture when only minutes before, that seemingly innocent sunny plant’s serrated edges had ripped a variety of tiny holes in my calves when I came over the ridge to the summit. Flora dualism or have I finally reached a point where I’m anthropomorphizing Saba’s durable vegetation as a lame cover for poor hiking skills? I’ll leave that opinion to you, dear readers. Cheers and have a great day!